One of my favorite things about frugality is that being frugal often forces me to think outside the box. If I am going to live a life consistent with frugality, it often means challenging the status quo and learning to think about money and expenses in a different way. There is a reason why this one is the first one on the list, and it’s because we’ve all got to eat! Not knowing how to cook or not liking to cook can kill your finances fast- not to mention your health. Meal planning in advance is also going to be a helpful habit. To do this, just determine at the beginning of the week what you are going to be eating that week, and shop accordingly. If your brain hurts just thinking about meal planning, look into something like $5 Meal Plan, and spend a few bucks a month to let someone do it for you. I’ve actually recently started using an app called Plan to Eat, which allows me to import my own recipes and meal plan/grocery shop using my smartphone. Winning! My friend is a personal trainer, and for years she has been training a married couple who eat out three meals a day, seven days a week because they don’t like to cook. They have been begging my friend to cook for them, because they know that she eats healthy. So starting January 1 this year, my friend became their cook. She makes three meals and two snacks a day for them (seven days a week), and they receive the food prepared and ready to heat. For this they are paying her $2500 a month (which also covers food cost). It’s great money for my friend, but awfully expensive for the couple! However, they are eating much healthier now, and in the six weeks since my friend has been cooking for them they have each lost more than 15 pounds. Frugal lesson: learn to like cooking. This can also be a biggie, because houses are expensive and taking care of them can also cost a pretty penny. Being able to do as much as possible on your own will end up saving you some cash! We’ve tackled things like unclogging drains, caulking, and fixing leaky faucets, as well as cleaning gutters. YouTube is a treasure trove of information to help get you started on pretty much any maintenance task. No one should expect an hour on YouTube to turn them into a mechanic overnight, but basic things like refilling windshield washer fluid, checking tire pressure, checking coolant level, and jump-starting a car are pretty straightforward skills that can usually be done by pretty much anyone. We haven’t ventured into changing our own oil yet (that’s on our list of frugal skills we want to learn), but Mr. CMF has started changing the batteries on our cars when they need replacing. This is another biggie! And I do think that money management is a skill. Having basic money management skills like making and executing a household budget, balancing a checkbook, negotiating monthly bills, calculating your net worth, and saving for retirement are skills that will pay dividends- literally- over time. This is on our list of things to learn and get better at! Part of frugality is becoming more self-reliant, and I cannot think of many better ways to accomplish this than by growing and preserving your own food. This year we plan to start small with some herbs indoors in pots and some tomatoes and green peppers outside. We also want to learn how to can/preserve produce this summer, so I’ll probably ask my mother-in-law over one day to teach me how to do this. I’ve included this one on the list of frugal skills you should know because costs can get out of hand if you aren’t good at entertaining yourself cheaply! Entertainment does not always have to mean attending a concert, a movie, or going out to eat. For example, I recently discovered that my library card to the public library in the town that I last lived in is still valid- and that library offers free online book borrowing. So lately I’ve been reading a lot of books for free through the library. Pretty sweet! Hiking, exercising the cheap way, visiting friends, and going to parks are other frugal activities that can be fun for the whole family. There are also great options to actually make some cash in your free time too, such as taking surveys (for example, via VIP Voice, Valued Opinions, Earning Station, or Harris Poll Online, or doing all your internet searches on Swagbucks. Often when something isn’t working properly it can be tempting to just replace it. However, developing a “try-to-fix-it-first” mentality can be a way to save yourself some serious cash. For example, just a few weeks ago my iPod was not working properly. It kept dying on me at the gym, even after I had just charged it. I was getting frustrated with it, and told hubby that a birthday gift idea for me would be a new iPod. He took it from me and started trying different cords to charge it. Have you used any of these frugal skills to save money? 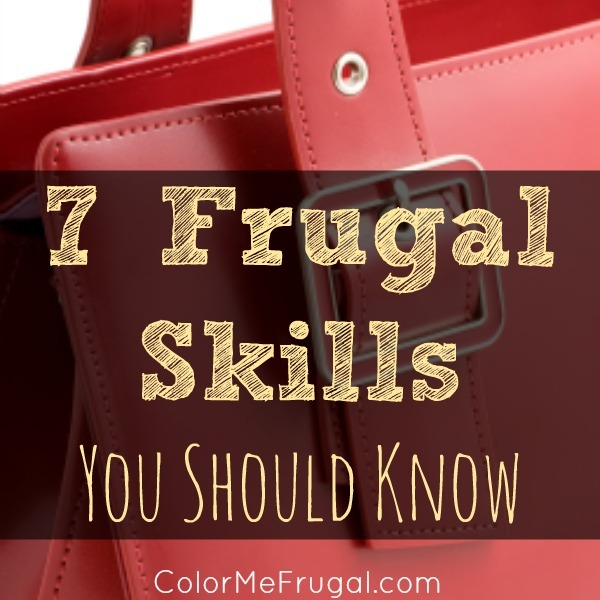 What’s the best frugal skill you’ve used, and how much do you think you’ve saved? Suggested Reading: One of my favorite books about forgetting the Joneses and livin’ the “stealth wealth” lifestyle is The Millionaire Next Door. This book profiles numerous individuals and couples who are masters of frugality- and, as the title indicates, are often millionaires. If you have not yet read this book, I definitely recommend that you give it a read. P.S. If you found these tips useful, don’t forget to subscribe to our mailing list! I have all of these except for auto maintenance skills! I have a feeling that is never going to happen! That’s pretty much the way I’ve always been. 🙂 We are trying to get better about this, though. I’d like it if we were able to at least change our own oil one day. Not only would that save us money, but it would save us the hassle of actually going to get oil changed. Our local Wal-Mart is probably the cheapest place, but they are always swamped with a two hour wait. So I try to use coupons that we get in the mail, but it means that we are always going to different places, some of which aren’t very close to our home. Ugh! Same here! I have always done some cooking, but I’ve gotten a lot better and branched out quite a bit since I started staying at home. That’s actually been one of the really nice side benefits of me staying at home- we are eating so much healthier now. I use YouTube all of the time to fix things around the house. It has saved me a ton of money. I usually watch the video first to see if it is something I can handle. I also use the internet for cooking. Its a great resource for finding new recipes. I’m not a great cook, but I can follow the easy recipes I find online and turn out some tasty dishes! The internet is where I find pretty much all of my recipes these days! I’m not someone who loves cooking every night. But I do have enough cooking skill to fill our bellies. That’s AWESOME about all the money you’ve saved on home renovation!! I really wish that either Mr. CMF or I had more skills in that area. We once tiled our laundry room, and it turned our pretty great (we self-taught on YouTube), but it took us forever!! I don’t consider myself to be an intense frugal person, but I have adopted more frugal habits to cut cost. I fell in love with cooking again and eat a lot healthier. I also found ways to have fun for free and I know I would have not done that if I wasn’t trying to save money. What it did was change my perspective on how to have fun and how to spend quality time spent with my child. It has been great. I’m not sure if I exactly love cooking, but I do love eating healthy. And since cooking at home is almost always healthier than eating out, I’ve been working to branch out more in my cooking. 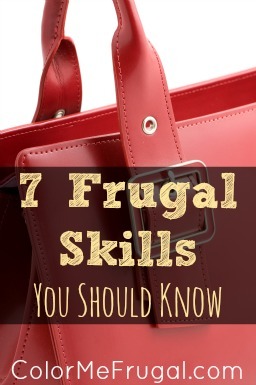 All of these frugal skills underlie self-sufficiency. The good thing is that self-sufficiency not only saves you a lot of money, but it can also be a lot of fun and personally rewarding too. I have learned to do most of these things relatively well, but I have not yet learned how to can stuff (maybe this summer). I also know my limits. There are some things that I simply won’t try myself no matter how much I’d like to save the money. For example, I leave most things electrical or plumbing-wise to a professional. Being frugal in other areas allows me to pay for these professional services when I need them. We do a tiny bit of plumbing stuff if needed, but we leave all electrical stuff to electricians. I do know some people who do their own electrical work who are not electricians, and it seems to work out ok for them. But I feel like because of the safety concerns inherent in electrical work, I just do not trust us to do it. We definitely leave that one to the professionals! Everything is on youtube, that should be a lot of peoples first go-to resource! I love YouTube. I actually taught myself to knit using YouTube- at least the basics I had pretty well down before I finally broke down a took a class to learn more advanced skills. I’ve been spending a lot less on entertainment by doing free things instead. I’m more in tune with nature and doing outside activities instead of spending so much money on entertainment purposes. Love it! We try to do this too, and I think as our daughter gets older we will focus even more on free activities- I don’t want her to grow up thinking that entertainment always means spending money! I have not ventured into being my own personal Mr. Fix-It yet, but I am an avid library user AND have really focused on reducing the amount of meals I eat outside of my home each month. I’ve seen my grocery budget increase somewhat, but the savings in my restaurant category more than outweigh those. One of my best frugal skills is setting aside any discretionary purchases (i.e. clothes) for a week before deciding whether or not I really want them. I’ve come to find that many times, I bought something on impulse, and a week later, I’m just not that excited about it…and back to the store it goes. It’s saved me hundreds each year! Imposing a mandatory wait period on all purchases is a GREAT way to save money! I personally try to spend as little time as possible in stores- it’s so easy to see something and buy it on impulse. Even if it’s just a pack of gum, it’s still money that in my heart of hearts I’d rather be saving! We’ve started cooking at home a lot more and it’s definitely saving us some money. Now we just have to get better at shopping smarter! My goal for this spring is to learn to garden! It’s the best of both worlds, I learn to cook more healthy and save money! Same here! I gardened way back in the day when I lived at my mother’s house, but this spring will be my first time with my own garden. Good luck to you! So many of these I don’t know yet! Preserving food and basic home/auto maintenance being my top three. In my defense, I’m a renter who doesn’t own a car and takes public transit. But as soon as I own a car again, I want to learn how to change a tire. It seems like such a simple thing to learn that is incredibly valuable when you need it. I think if you rent and don’t have a car, you get a pass on some of these! I am really looking forward to learning how to can this summer. I love these suggestions and honestly I think that in our house cooking ahead of time saves us money since we have meals prepared for busy days instead of opting to just get take out. Also our board game / puzzle night is much cheaper than buying entertainment elsewhere! Planning our meals ahead of time has been a huge help as we’ve started cooking more at home! Now I keep a calendar on the wall that has our planned meals for the month. Great list! I’ve not spent much time with the automotive stuff, but I’ve dinked around with my car when I needed to. As for the house, cooking, fixing, money management stuff – I’m doing pretty good! ~M. We’ve gotten a lot better about cooking in the last couple years. I’ve also gotten a bread machine and started baking my own bread- it’s amazing! Just how I am, I like to do things myself and if I don’t know how.. I WILL learn. Youtube is awesome for this. Never made an omelet before I was married, taught myself then taught my wife, now everyone loves her omelets too. the community college here has an evening class called “basic auto maintenance”. Best $50 I’ve spent for 10 hours of class. I learn much better hands on. So this was great. I still don’t like changing the oil. But it’s good to feel confident that I can change a tire or follow auto repair by someone else. I hope that keeps mechanics honest. That’s excellent! Oh, I’m going to check to see if anything like that is offered in our area. What a GREAT idea!! I love your website sorry to ask but love your wallet where can we get it??? I’d also add that taking care of what you already have is huge. Whether is polishing your own shoes, sewing on buttons, keeping your coffee maker clean or caring for your pet. If you take care of it and protect it from damage, you won’t need to repair it or worse replace it. That’s a GREAT skill to have! I like your tip about learning how to do basic home maintenance. Knowing how to do simple tasks like cleaning out gutters or calking can help save a lot of money. However, like Jason said in the comments, it’s important to know your limits and to leave certain tasks, like electrical repairs, to the professionals. Thanks for the article! Agreed! We have never attempted our own electrical work for that very reason. I have friends who do it and they make it seem (and look) easy, but we prefer to be safe rather than sorry in this area. I think basic home management and fixing things go hand in hand. These may be the two most expensive things in your home but if you can learn some skills you can save tons. Exactly! It’s a great way to save if you are willing and able to learn a few basic skills.